In late February, a team from GLTAAC visited the Northeast Indiana Regional Partnership (the Partnership) LEDO Council and presented information regarding local import exposure and resources for manufacturers who are struggling to compete with imports. GLTAAC manages the Trade Adjustment Assistance for Firms (TAAF) program for companies located in Indiana, Michigan and Ohio. We track high import exposure industries in our region to help identify companies who can benefit from the TAAF program. The 11-county LEDO Council is comprised of economic development organization representatives in the Northeast Indiana region. They focus on addressing business retention and the needs of companies looking to expand or relocate to Northeast Indiana and the surrounding area. Regional economic development organizations, like Northeast Indiana Regional Partnership, are key referral partners to GLTAAC. Like many regional economic development organizations in the Great Lakes region, the manufacturing industry base in the Partnership region has been heavily impacted by foreign competitors. At GLTAAC, we track and analyze US imports and their potential impact on manufacturers in our region. With this data, we prepare Import Exposure Profiles down to the regional and county levels to provide our partners with specific information in their area. These reports have proven to be a useful tool to help REDOs and LEDOs understand exposure in their area and identify manufacturing clients who can benefit from TAAF. 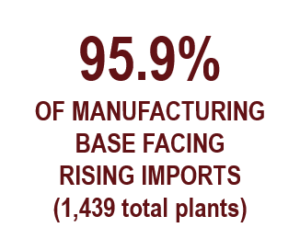 96% from a total of 1,439 manufacturing establishments within the Northeast Indiana region (County Business Patterns, 2016) are in industries that faced rising imports over the past year. 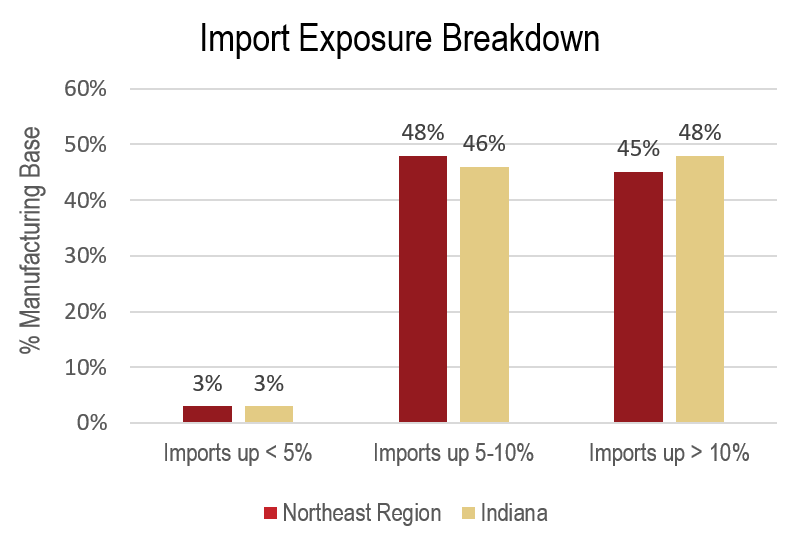 Manufacturers in the Northeast Indiana region have experienced an average in import increases of about 10%, on average, over the past year. 48% of the 1,439 manufacturing establishments belong to industries which have faced an increase in imports from 5 to 10% over the last year. This figure is slightly upward from the State’s number, which is around 46%. 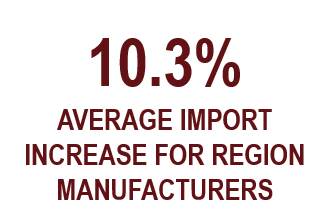 45% of the 1,439 manufacturing establishments in this Region belong to industries which have faced an increase in imports above 10% over the last year. This number is a few points below the 48% State figure. Prior to the February LEDO Council meeting, Scott Phillips, GLTAAC Senior Project Manager, met with John Sampson, CEO of the Partnership to share the import exposure statistics for the northeast Indiana region and discuss ways GLTAAC can engage with the LEDO Council. Regional and local economic development organizations find the TAAF to be another “arrow in their quiver”, as they look for ways to add value to their clients and stakeholders. As follow up, Phillips completed an outreach meeting with Isaac Lee, Director of the Steuben County EDC which resulted in a manufacturing firm referral in Steuben County. GLTAAC staff conducted post-meeting outreach to each LEDO director, leading to a conversation with Bruce Stach, Business Consultant Whitley County EDC, who will be seeking qualified prospects for the TAAF program. Click here to see the full report for the Northeast Indiana Region. To understand more about import exposure data, click here for an article explaining the data analysis process. Our goal is to identify TAAF prospects in each county in Indiana, Michigan and Ohio. Let us know if you would like an import exposure profile for your region or county, we would be happy to produce a customized report for you.